Affected by breast cancer? Join this group to share experiences and ask questions to people who understand what you're going through. I have had this idea for a new thread, not sure how much interest there will be and only one way to find out! Anyone fancy joining an art club? I thought we could have a subject each month, take it in turns to choose. Then anyone who wants to can draw, sketch or paint their picture and we can all share our creations. You can interpret it how you like: black & white, colour, abstract, cartoon... no rules. Im not a great artist but I do enjoy the process of drawing and colouring in. It’s quite therapeutic for me but for ages now I haven’t picked up my sketch pad. I need a bit more impetus and thought this might help. 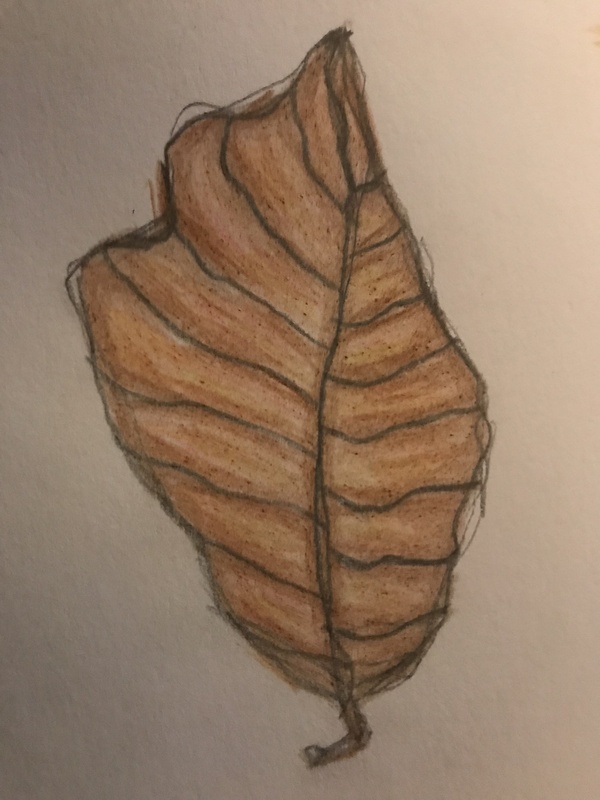 So, for January the theme is leaves. Or a leaf. Dead or alive, indoors or outdoors. I commit to producing something and posting it up on here before the end of the month. I hope some of you do the same! What a great idea! Can I pop one on? Good idea Leolady, any medium welcomed! This is a lovely pic. The walking thread has made me much more observant when I am out and about and it’s good to notice something to snap and share. Yesterday I got out my sketch pad and pencils, which is good progress for me. Fab-u-loso Idea,Amalie...well done...love it....and yes...there IS something about colouring in...love it xxxxooooo!!excited! !xxxxlovely pics already!! Love this Violetsniff. It has made me think about getting back on the Crafts and BC site. It's so good when we have these skills to take our mind off the awful treatments etc. MAMMOGRAMS save lives, I'm the proof!!! 7 rounds of chemo, finished 30th May 2018. 15 zaps of radiotherapy, finished 26th July 2018. Thankyou taralou...and I just LOVE your persian dream blanket on Crafts and BC!! !I want it now!! I picked up some nice oak leaves also and will try to do one of those this month. I have no skill with pen and pad myself, but I'd love to be part of this as an observer, if that is OK! When I started this thread I was ambitious about doing more drawing, however I have only managed the one so far, a couple of weeks ago! I should have another go this weekend. I’m not artistic, I can’t draw. I see photography as a type of art. I love photography, I am by no means a photographer I just like to take photos so if allowed, I like to post a few.